The first thing I did was to apply masking fluid to the absolute whites that I wanted to save. 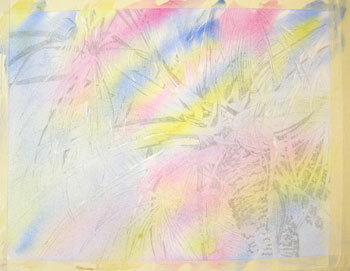 After the masking was completely dry I wet the paper gently with clear water and a 2 inch soft brush. I apply a lot of water so that it puddles on the paper. Then I tip the board back and forth to keep the liquid flowing in all directions so that the paper absorbs the water evenly. Once the water has soaked into the paper, has lost most of the "puddle" and simply looks shiny, I add the three primary colors. I don't blend them with my brush, I simply drop then onto areas of the paper, tipping the board, allowing gravity and the wetness of the paper and pigments to softly blend the edges. I want to keep this relatively light as these colors will represent the second lightest values in my painting. They will also act as underpainting for the next few washes. This will dry quite a bit lighter than it looks when applied. Now this has to dry completely - bone dry - before I can work on it again.